3.1 What's a Click Mode? iMacros is distributed as a browser add-on for Firefox, Chrome, and Internet Explorer. Two of the commercial editions of iMacros (Standard Edition and Enterprise Edition) also include the standalone iMacros Browser, a derivative of IE with a command-line interface. This article primarily covers interaction with the iMacros Browser, however, the concepts and interface are fairly consistent among all the different versions of iMacros. Throughout this Wiki, iMacros commands and functionality are are associated with browser icons ( ) to designate their applicability to a particular browser. 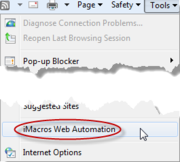 You can also start iMacros for IE by selecting 'iMacros Web Automation' from the IE Tools menu. To start the iMacros Browser, select the program from the Windows Start Menu, double-click the icon on your desktop, or navigate to the file "imacros.exe" (typically in C:\Program Files\iOpus\iMacros) and double-click it using Windows Explorer. We have invested a lot of effort in making the Graphical User Interface of the iMacros Browser and the Internet Explorer add-on as intuitive as possible. This section explains the basic elements. The main window consists of three parts: the menu and toolbar at the top, the iMacros sidebar on the left, and the browser window on the right. Web pages are displayed in the browser window using a tabbed interface just like other browsers. You control iMacros with the elements in the sidebar on the left. The iMacros sidebar is divided into two parts. The top half displays a tree view of all your macros when iMacros is stopped, and the current macro code when you are playing or recording a macro. Only files with an .iim or .iimx (obfuscated macros) extension in the Macros folder are recognized by iMacros. The Macros folder is specified in the Path settings of the iMacros Options. The default macro folder is located in My Documents under iMacros\Macros. The lower half of the sidebar consists of three tabs: Play, Record, and Edit. As the names suggest, the Play tab contains controls for playing macros, the Record tab contains controls for recording macros, and the Edit tab contains controls for editing macros, changing options, and getting help. Note: Navigating through fields with the keyboard (i.e. using the TAB key) is not supported and will not be recorded. Before recording, it is important to understand the different modes of recording that you can use. This is also known as the Click Mode. The three main click modes are Automatic, Expert (Use complete HTML tag), and DirectScreen. To select a click mode, use the ClickMode menu item or open the Click Mode Dialog from the main toolbar or Record tab. iMacros attempts to choose the best recording options (recommended in most cases for recording on HTML websites). In the automatic mode iMacros looks at the different attributes an element has (such as ID, NAME, Text, HREF, etc.) and selects the one attribute it thinks fits best (for details, please see the "For advanced users" description). Note that the automatic mode never switches to Expert or DirectScreen mode. If you need these recording modes, please select them manually. This is the ultimate solution if everything else fails. It simulates standard mouse clicks and movement within the browser window. This feature works with all web pages. For non-html elements such as Flash or Silverlight, you must use the DirectScreen mode. DirectScreen is only available in the iMacros Browser and iMacros for IE commercial editions. Image validation (IMAGECLICK) combines the power of DirectScreen with computer vision. To use it, open the Image Validation Wizard. For more details please see Image Recognition. In most cases you will record your macros using just one click mode, but you aren't limited to just one click mode per macro. In fact, you can mix the modes in a single macro by changing the click mode while you are recording! This is useful if you encounter problems while attempting to record one or more elements on a web page: simply switch to a different click mode and try clicking the element again. You may also have to change click modes if you notice that your recorded commands are not playing back successfully. In this case try selecting a different click mode and re-record your macro. Click the "Record" button on the toolbar. Now simply perform whatever tasks you wish to record, such as surfing to web sites, filling out forms, making a test order on your e-commerce site or any other task of your choosing. After you have finished recording press "Stop". The current recording is automatically saved as a macro named "#Current". Press "Save Macro As..." to save it as a different name, or right-click the macro in the macro list and select "Rename". Select elements to record by clicking them with the mouse (don't use the TAB key to navigate through fields). During recording do not use your browser's Back or Forward button or change the address line. Use the buttons supplied by iMacros instead (iMacros Browser and IE add-on only). Recording "Clicks". If a macro generates an error during replay you can experiment by selecting the link recording option (Click Mode) manually from the dialog after clicking Click Mode. The iMacros Standard and Enterprise Edition licenses include free Silver Level tech support, so our support team is ready to help you with your project and any recording issues that you might encounter. Note: The relationship between a recorded TAG command and the actual web page HTML code is fully documented. There is also an example page to test the iMacros recording. 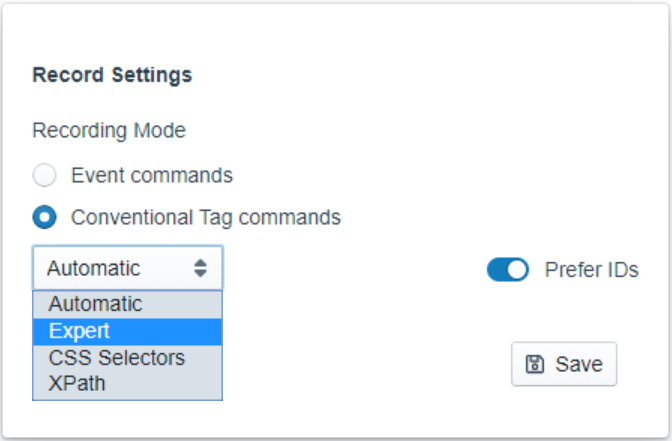 Advanced users can use this documentation to manually created TAG commands based on the HTML source of the website and/or have a program generate the iMacros macro commands. Click the "Play" button on the toolbar. Click the "Play" button or on the Play tab of the sidebar. During playback a blue frame shows you which parts of the web page are being manipulated. To play a recorded sequence multiple times, fill in the Max. number of times to repeat the macro and press the "Play (Loop)" button. There are two different options that affect the speed at which macros are replayed. These can be set in the General tab of the Options dialog as well as within the macro with the !REPLAYSPEED variable. FAST: the macro is replayed at maximum speed (Recommended in most cases). MEDIUM: iMacros waits for 0.25s between each command. SLOW: iMacros waits for 1s between each command. The second option is to add timing information during recording (DirectScreen click-mode only). If the "Add timing information" checkbox is checked in the Click Mode Dialog, then WAIT statements are automatically included in the macro. Thus, during replay these WAIT statements slow down the macro playback. All recorded macros are stored as a plain text file with the an .iim extension in the folder specified by the "Folder Macros" setting on the Path tab of the Options dialog. The default macro folder is located in My Documents under iMacros\Macros. You can manually edit and tweak the macros using any text editor you like, for example Notepad, which is shipped with the Windows operating system by default. Click the "Edit Macro" button on the toolbar. Click the "Edit Macro" button on the Edit tab of the sidebar.